From Margaret Moseley, the Edgar Award-nominated author of the bestselling Bonita Faye, comes a wickedly funny, delightfully unusual mystery novel featuring a very unlikely detective. For the little schizo in all of us! Bag lady Milicent, the charming narrator of this fanciful standalone originally published in 2001, has a long list of mental health issues , including obsessive-compulsive disorder and convenient to her losses of memory. In Portsmith , a town built on a bluff overlooking the Mississippi River, Milicent happens to be the only witness (and, for a while, the only suspect) in the death of high school girl Angie Woodburn in an apparent hit-and-run. The Portsmith police chief, Wade Tate, and the town’s wealthy maiden lady, Miss Vinnie Ledbetter, who have taken Milicent under their sturdy wings, try as best they can to keep her out of jail and out of trouble, smoothing her way by providing money, food, and warm clothes when needed. 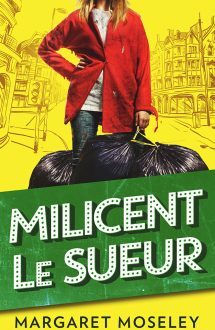 Milicent’s resourcefulness in cadging food and hitching rides in horse trailers, and her eloquent descriptions of the joys of sleeping on the ground under the stars, are just as important as the clues she digs out of Dumpsters.